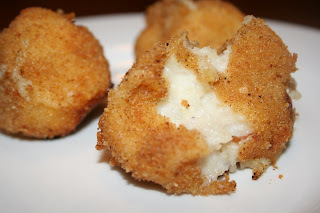 When my husband and I went out for our anniversary we were given a sample of some potato croquettes that were served along side one of the specials of the evening. Neither of us got that special but as soon as we tried the potatoes we both almost wanted to change our order just to get more of these delicious bites of heaven. I mean, they were balls of delicious mashed potatoes, rolled in breadcrumbs and fried. Certainly decidant! Rob immediately asked if I could try to make them at home and I figured why not?! Plus, it gave me an excuse to try another one! While I still don't think mine were as good as the one's from the restaurant (Roberto's Trattoria in St. Louis), they were melt in your mouth good! Below is the recipe I put together when making them, however I have to be honest that I made mine a little bigger than I put in the recipe because they'd be better that way and I'll have to make them that way next time! Please note that these are rich, so a little can go a long way, but that is only if you want it to! I believe an average size serving of these would probably be like 3 per person with their meal. In a large pot, boil the potatoes until fork tender, drain and peel. In a separate bowl, mash potatoes and mix in 1/4 cup of the cream, the cheese, pancetta, chives and S&P to taste. Add more cream if necessary, however you do not want a loose potato mash as it won't ball up as well. Place the potato mash in the freezer for about 20 minutes, or the fridge for about 35, or until chilled enough to hold together well for handling. Start heating up oil for frying - either in a deep skillet or deep fryer. Set up the flour, eggs (whisked) and breadcrumbs in 3 separate shallow dishes/bowls for dredging. Roll potatoes in to about 1 or 1 1/4" balls, or croquettes. Dredge the potato croquettes in the flour, shaking off excess, then egg, shaking off excess and finally the breadcrumbs. Gently place in the hot oil and fry until golden, about 5 minutes, gently flipping once. Remove to a paper towel lined plate to drain and cool slightly. Repeat with remaining croquettes. These sound really good! I think I am going to have to try these. Thanks! oh goodness these look amazingly delcious! Mmmm I love croquettes. I have never deep fried before but I may have to for these!